So, I may have mentioned my new coverstitch machine once or twice. In the seven months I've been using it, I've hemmed more than 50 knit garments. And not one of those hems has broken. Having a coverstitch machine has been a game changer for me. I have not purchased a single knit garment for anyone in my family since I started using it. Before, I would sew the t-shirts and the leggings, but it was usually an exercise in frustration. My sewing machine, I suspect, hates knits more than most sewing machines. Despite my best efforts and all the tricks in the book (stretch stitch, walking foot, stretch needle, ballpoint needle, Microtex needle, universal needle, knit stay tape, regular stay tape, Wonder tape, tissue paper, Woolly Nylon, etc.- seriously, I have tried everything); no matter what, the machine would still skip stitches and chew up and/or build giant poopy birds' nests under my fabric. The tension would be uneven, and sometimes it would just stop sewing altogether. And still, I would muddle through, get it done and make it work. But then a day/week/month later the hem would break and then the garment would molder in my mending pile forever. And because I hate mending, often my kids would outgrow the clothes before I took care of them. Wasted time, wasted fabric. And this made me more apt to throw a few t-shirts into my cart at the thrift store. But now? Between my serger (Brother 1034D) and my coverstitch (Brother 2340CV), I can sew all the knits. I can use hem bands if I want to, but if I don't want to, I am free to turn up and coverstitch any old hem I please. The coverstitch is not fiddly to thread like my serger, so changing threads really isn't a big deal. And I use it all the time. For me, the coverstitch made sense. 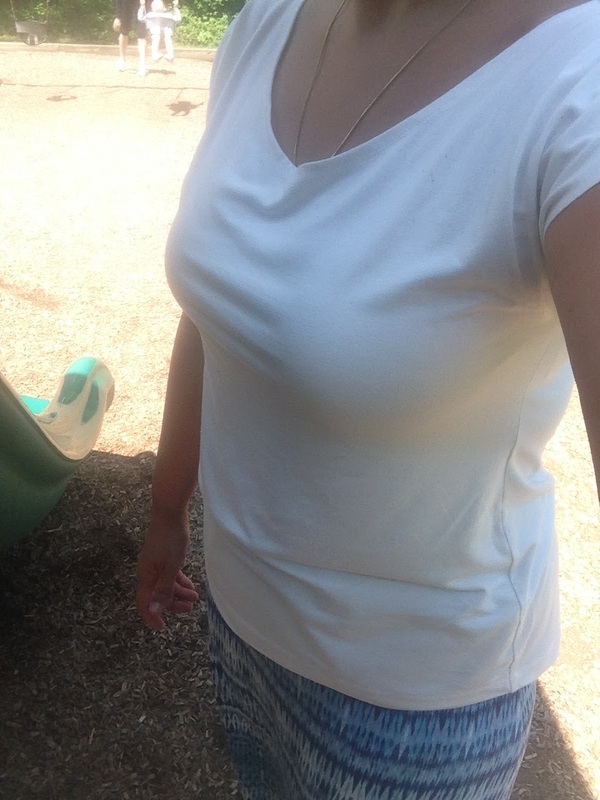 My kids and I live in knits, and for Natasha and myself especially, it's not easy to find tees and leggings that fit properly. I love being able to sew them for us, and now I love not having to mend them. 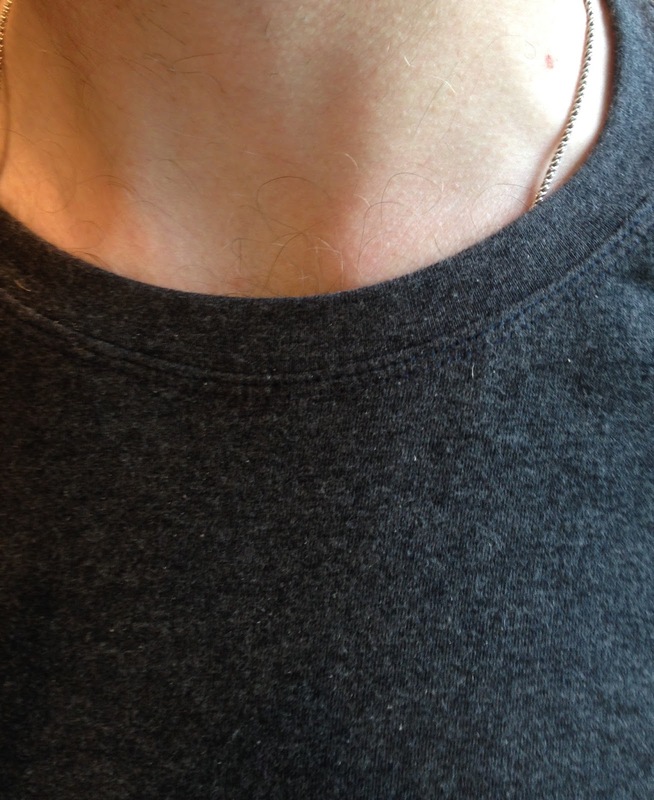 If you sew a lot of knits and have trouble with popping hems, I'm here to tell you that the coverstitch is a worthwhile investment and that you really won't regret getting one. 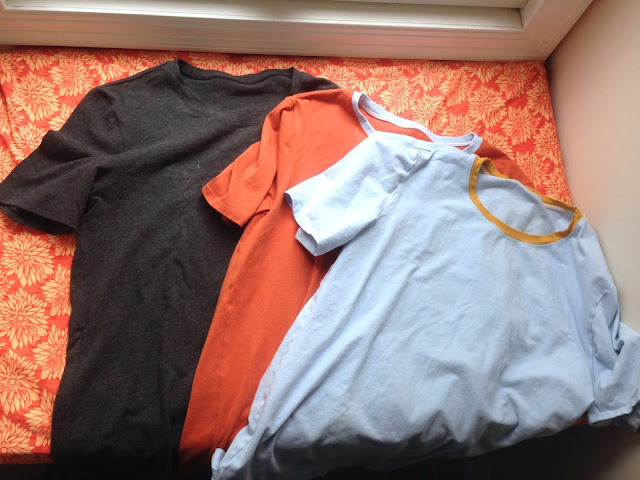 Recently I used the coverstitch to finish three Thread Theory Strathcona tees that I made my husband earlier this month. Like any smart fabricaholic, I used J's lack of enthusiasm vis a vis the fabric I chose for his first Strathcona, to buy more fabric. I made sure there was an orange knit in the bunch for my neutral-hating husband. I sewed the shirts in a size medium again. I shortened all the sleeves by 3" and hemmed them up 1/2". 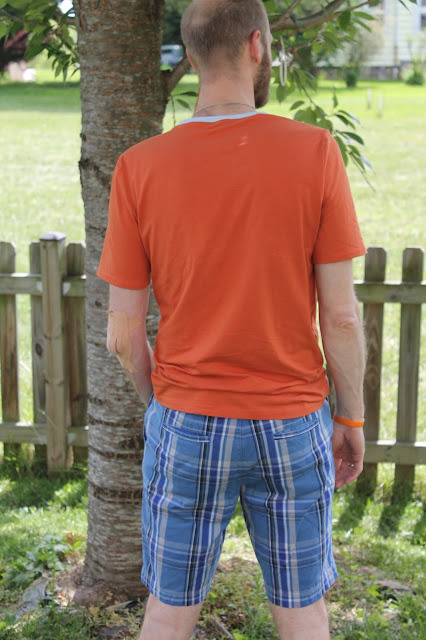 The length on the orange tee is per the pattern; the other two are shortened by 1". His first comment upon trying them on was, "Wow, these are stretchy." I guess he doesn't have much experience wearing Lycra, but as he has to use his right arm to stuff his left through the sleeve, the stretch actually makes it easier for him to put these on. Score one for wife-made shirts. The knits are all from The Fabric Fairy, except for the mustard neckband on the light blue shirt, which is Art Gallery knit in Sahara Sun. The light blue and the charcoal are both beefy 10 oz knits with excellent recovery. They are fabulous - a rare cotton/lycra knit that is truly thick and stretchy enough to make durable kid leggings - and I plan to order more of the charcoal for just that purpose. I have no affiliation with The Fabric Fairy - I just think these are really high-quality fabrics. Since I made these, J has been wearing them whenever he's home. That makes me happy, and I'll make him a few long-sleeved ones in the fall. 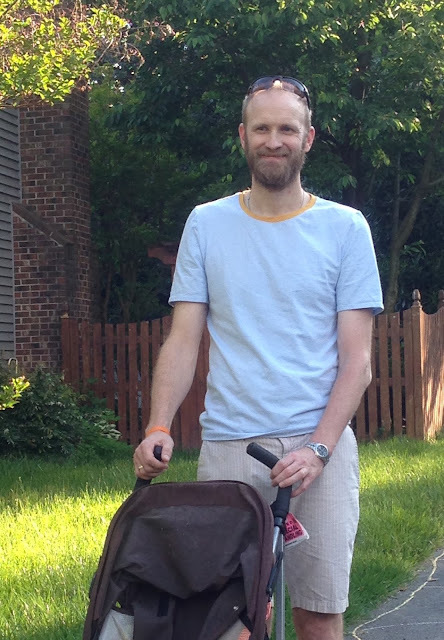 But I got it done, and I am not sure that would have happened without the external motivation of Kids Clothes Week. Here is the final batch. For Niko, a rash guard using the Oliver+S Field Trip pattern in size 12-18 months and a pair of Euro Swim Trunks. The trunks pattern comes in sizes 2T-5T, so I graded the pattern down to a 12-month size by chopping off 1/4" on all seams (this is the difference between the sizes in the pattern). When I was done, the rise was a bit low. So instead of folding over the waist and using elastic, I made a yoga band. I cut my fabric about 2.5" by 14" and then stretched it to fit. It works very nicely and I think it will be more comfortable for him than an elastic waist. 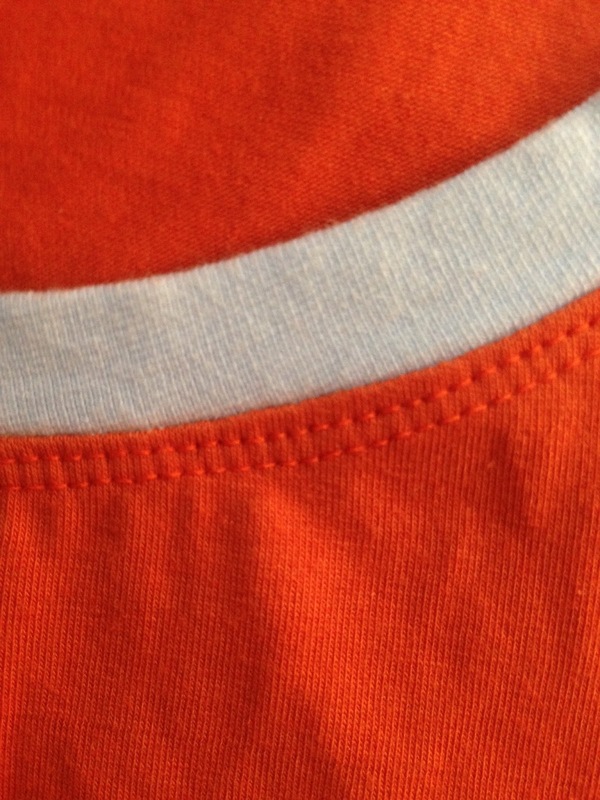 I overstitched the curve; it's hard to see in the photo (that orange is hard to photograph in the morning! ), but I love how it looks. All fabrics are from The Fabric Fairy. I don't love the orange; even the "matte" side of it is too shiny for my taste, and it was really slippery and hard to sew. But I do love how it looks with the aqua gingham. For these projects, I bought a half yard of each fabric (plus a half yard of the red I used in Gabriel's set), and I got two rash guards and four pairs of trunks out of them, plus I have enough left to make a few more things. While the kids are small I definitely prefer to buy swimsuit fabric from places that will sell it by the half yard. 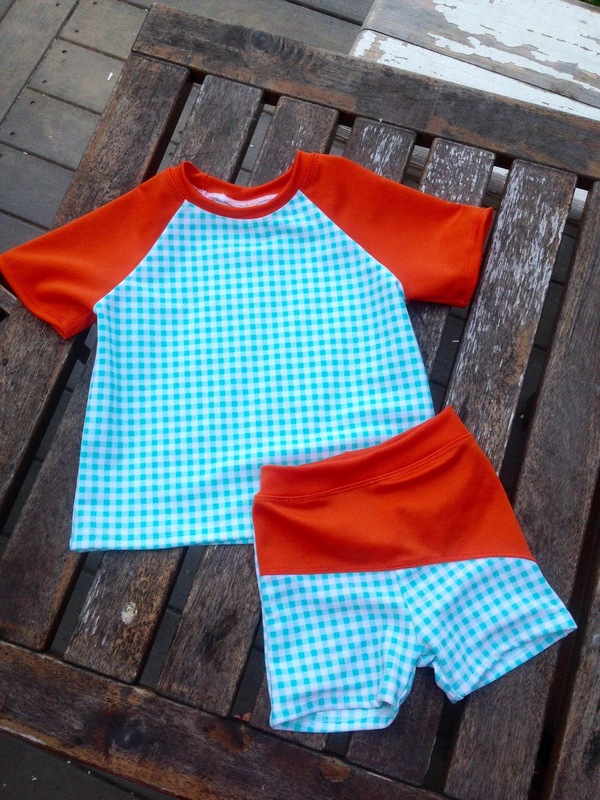 Moving on, I made coordinating trunks in the navy gingham and the orange for both boys. They both have store-bought rash guards that will go with these so I didn't bother making more rash guards. Again I made a yoga waist for Niko's pair. 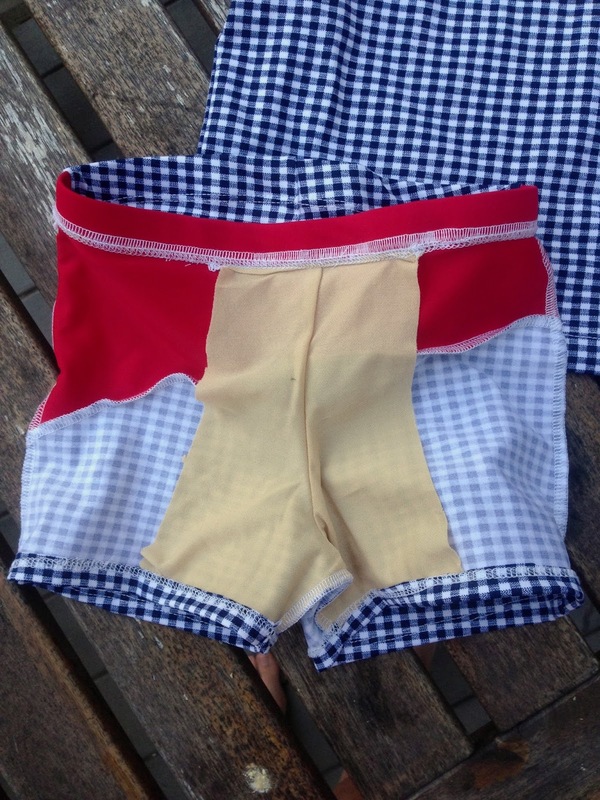 For G's (again in a 4T with 19" elastic), I used the stripe variation of the Euro trunks pattern. I figured I should switch it up, but the curve is still my favorite. One girl's swimsuit, one girl's bikini bottom, two boys' rash guards and four pairs of boys' trunks, and swimsuit season is done. I have two days left of KCW but I may just call it quits here. On Tuesday and Wednesday I sewed Gabriel a new pair of Euro Swim Trunks and a rash guard made using the Oliver+S Field Trip pattern. 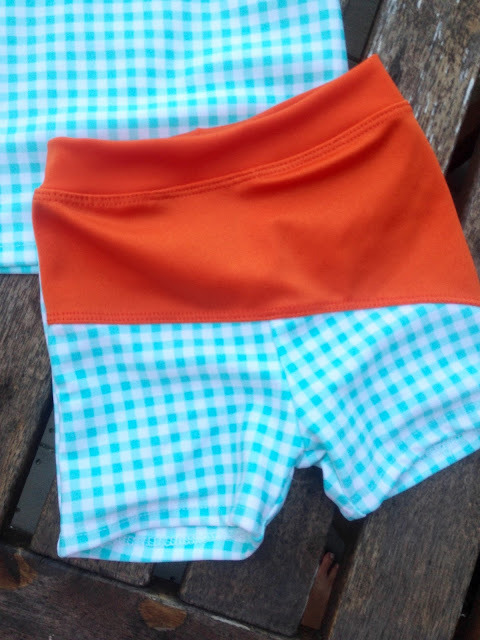 The trunks are a 4T with a 19.5" waistband. I really love this curved color block view of these shorts. My sewing machine was in the shop, so I left out the buttonhole/drawstring mechanism. The rash guard is a size 3T with the length of a 4T plus an extra inch (because that was already traced out and seemed like it would work). And because I was working with just the serger and the coverstitch machine, I didn't gather the pocket. Instead I folded the ends in until I had a rough rectangle and then coverstitched it down. Because I like to see the insides before I buy a pattern, here is a picture of the shorts lining. 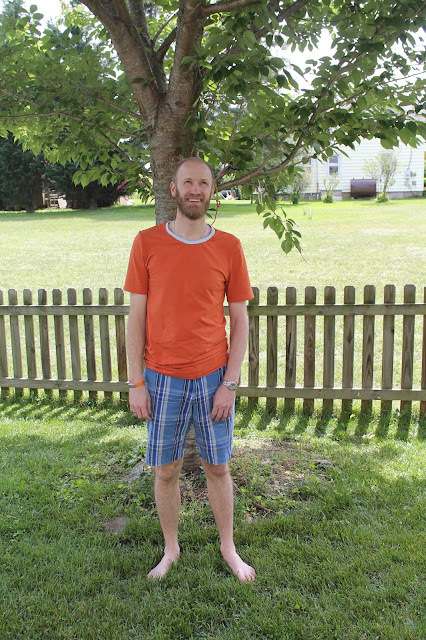 As I mentioned the last time I made these shorts, I'm unsure about the utility of the lining, but I guess it's just there to keep the shorts from being too form-fitting in that area. Both fabrics are from The Fabric Fairy. 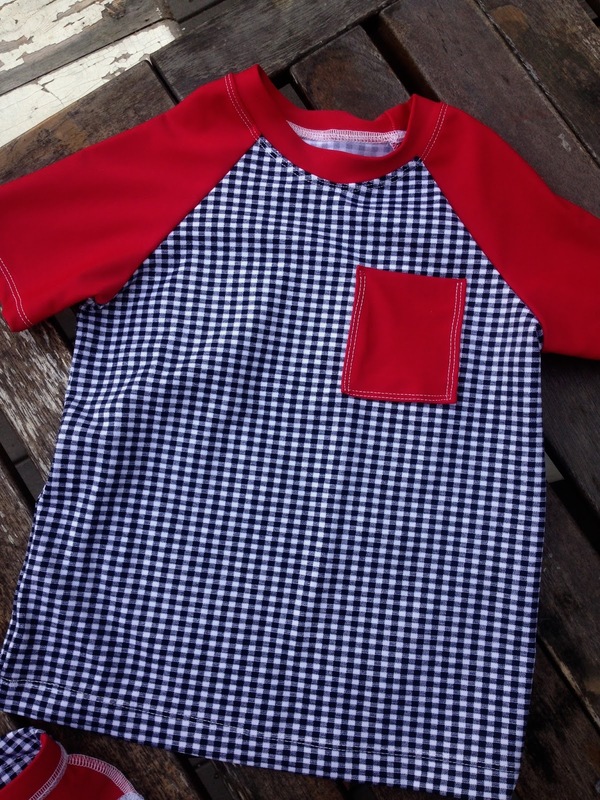 The navy gingham in particular is a gorgeous fabric. It's not slick or shiny and has a spongy, almost cottony feel to it. 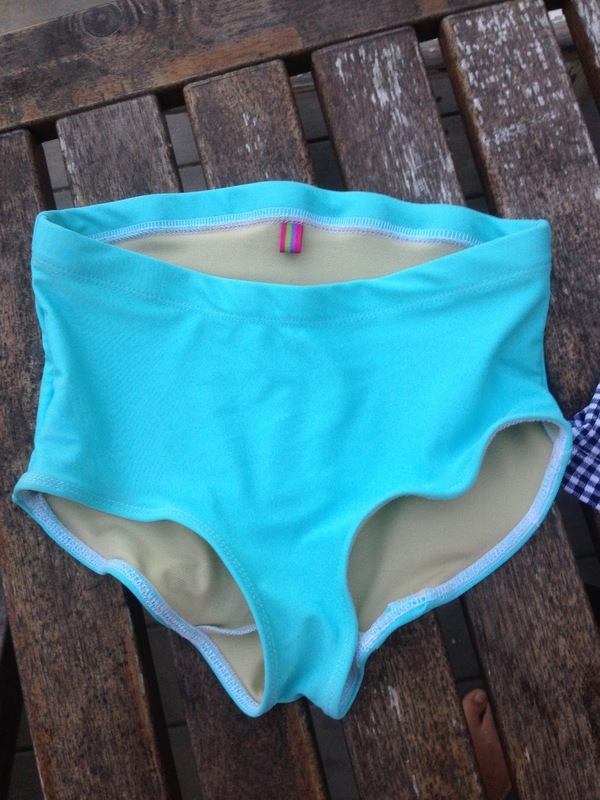 I also sewed up a pair of swimsuit bottoms for Z to replace a pair that we lost at the beach last summer. I used the bottoms from the bikini view of the Cosi Swimsuit. They are very high-waisted, so I cut 1.5" off the waist, then serged 3/4" elastic to the top of the waistband, turned and coverstitched. The leg openings were smaller than her legs, so I thought I could leave the elastic out. When I tried it on her without leg elastic, though, the fabric migrated to the middle of her rear, so I put it in. The bottoms look funny because the elastic is longer than the leg opening, but they fit very nicely. I've got one more pair of swim trunks cut out for Gabriel, and then I need to sew trunks and a rash guard for Niko. It's taking a lot of discipline to stick to my KCW plans, though - I really want to get back to sewing for me! As usual, I'm ignoring the Kids Clothes Week theme and using the motivation to whip up some basics. The pool opens this weekend, and I will be sewing swimwear all week. Of my four children, only Z has enough suits for the summer (though I will be sewing her a pair of bottoms to replace ones that we lost at the beach last summer). First up was Miss N. She has two suits that fit well and one that is a bit snug. I let her choose her own fabric this year, and she picked out this great honeybee print from The Fabric Fairy. It is a directional fabric, so I had to buy a whole yard, which means that I have enough left for another suit. I sewed View C of the Cosi Swimsuit. It is a fully-lined size 5 with the top of the bodice extended to the size 7 line. After I sewed it, I ended up taking in the sides to about the width of a 4. But she needs the extra crotch length and booty room of the 5, so I couldn't have just sewn a straight 4. Even with fully lining the suit, and with the alterations I had to make, this suit took less than three hours to create, from cutting to weaving in ends. Selfie fatigue is a real thing. Never having participated in Me-Made-May, I didn't really understand what people meant when they said they had it. But I already do. It probably has partly to do with the fact that I really just wear the same clothes over and over again all the time - they are constantly being smeared with snot and mud so there's no point in subjecting lots of different garments to that sort of treatment. That's my life these days. So my photos are pretty monotonous. And it's been rainy for 95% of May so far. But I'm still truckin' on Me-Made-May in general. I had pledged to wear me-made four times a week, but I've only missed four days so far. 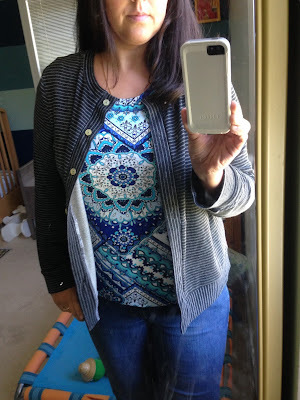 May 9: I wore my Made By Rae Josephine blouse with my Lisbon cardigan. I love this blouse but the elastic is just a teeny bit too tight around my arms. If I fixed that, I'd wear it a lot more often. May 10: Still rainy and dreary - I wore a Plantain tee and my trusty Lisbon cardigan. May 11: Finished up the day in a pair of me-made cozy thermal knit pj bottoms and ... what else ... my Lisbon cardigan over a RTW tank top. May 13: Slightly warmer, with a hope of sun which sadly went unfulfilled. 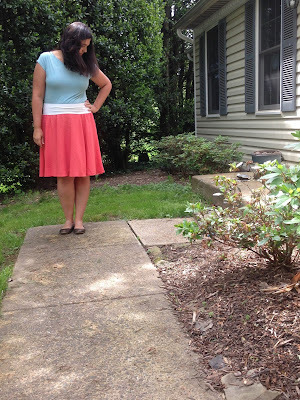 I wore a my rayon Plantain/Renfrew mash up tee with a ponte knit pencil skirt. 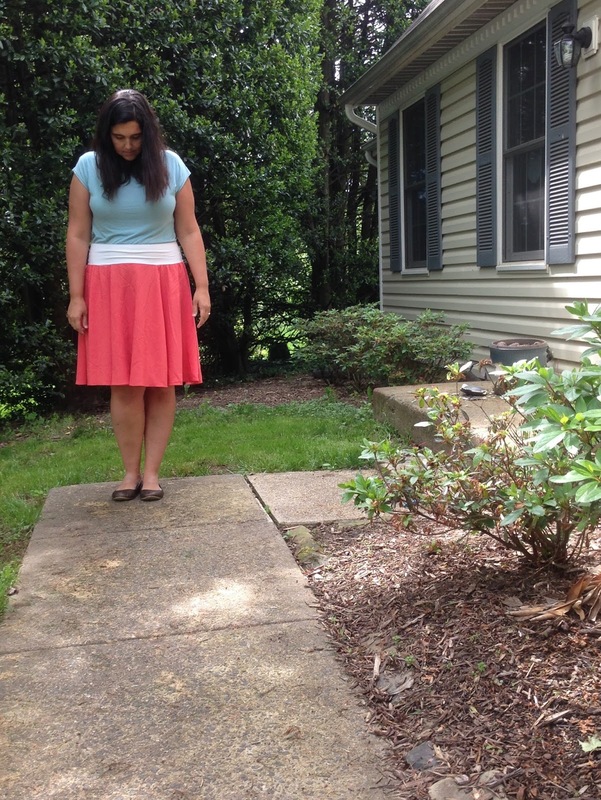 May 14: A rayon jersey Kirsten Kimono tee with my new rayon challis Dyyni Skirt. It wasn't really warm enough for this outfit so I ended up changing later into jeans and guess which cardigan? 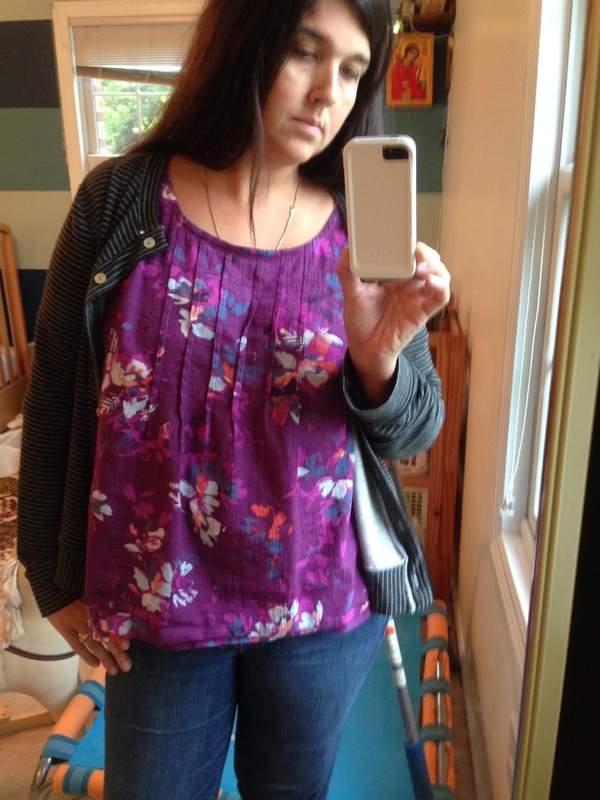 May 15: The McCall's 3341 with a thrifted cardigan and RTW tee that I've had for about 10 years. This day I was also a little under-dressed for the weather, but I'm not going back to tights and boots until fall! 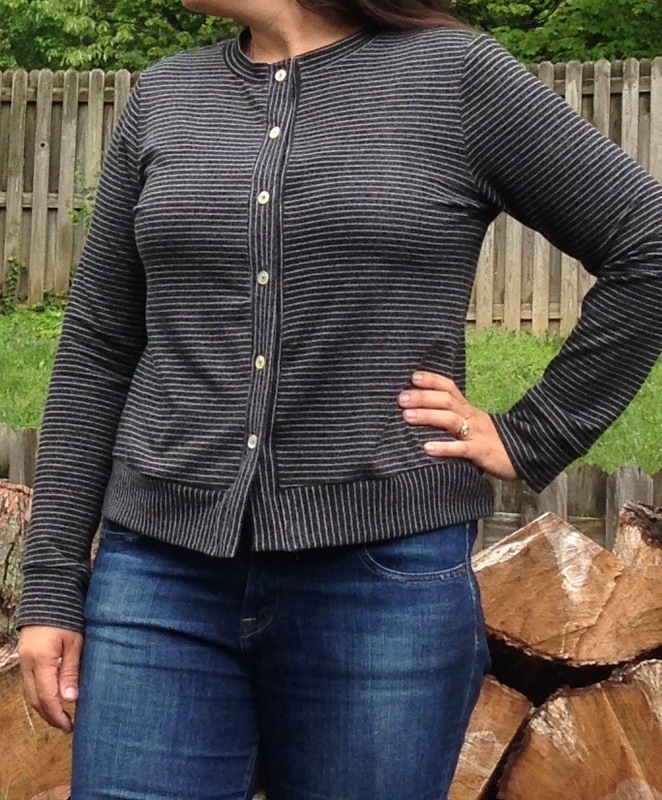 May 16: Once again, I wore thrifted jeans with a me-made tee and my trusty Lisbon cardigan. At this point I stopped Instagramming the photos because they are so repetitive! May 17: Another cold and rainy day. I wore my long-sleeved Renfrew tee and the Lisbon cardigan. I did actually start sewing a second cardigan today but it is lacy and more of a evening-out kind of cardigan than a cozy ward-off-the-unseasonable-chill cardi. May 19: Rayon Plantain/Renfrew mash-up again with my first Colette Mabel. May 20: A brand-new Kirsten Kimono tee in a beautiful thick and drapey knit, worn with a rtw maxi skirt. By the end of the day it was stained in three places. This is why I usually do not buy white fabric. 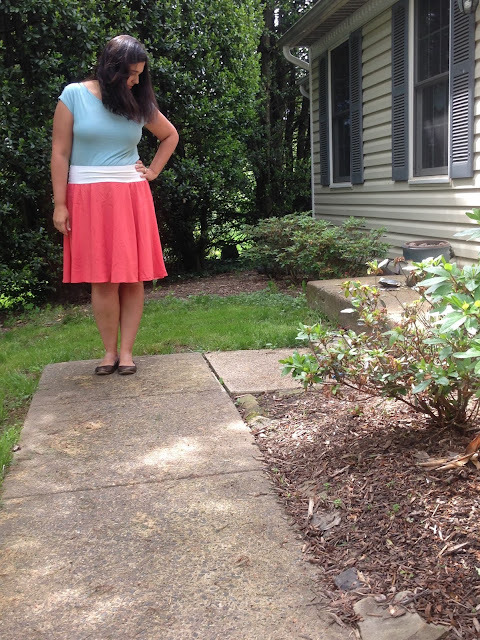 May 21: The same thing I wore on May 4: my navy and white striped Plantain and a denim quarter-circle skirt. I don't really like circle skirts. I think they look cute on the super-skinny, but if you're trying to downplay generous hips or the midsection in general, I find that they add a lot of bulk. 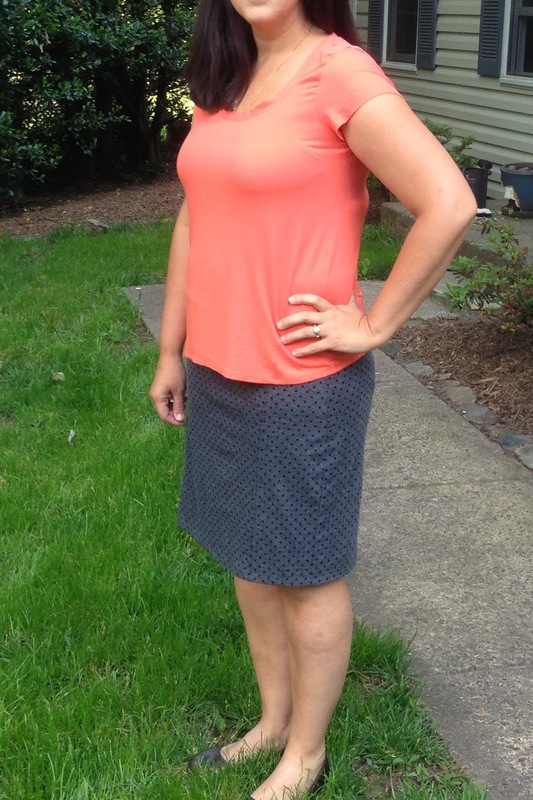 I also find that a straight- or pencil-skirt silhouette is more flattering to larger calves like mine. And yet, earlier this month I sewed one. Made of flowy rayon challis with a wide yoga waistband, it is comfortable, drapey and flowy and doesn't add extra pounds where I don't want them added. Who knew I could like a circle skirt? This is the adult version of the Dyyni Skirt pattern from Pienkel, which is being released today. I didn't actually realize that it was a circle skirt when I volunteered to test. I'm glad I didn't realize it, because I never would have volunteered, and I would still be under the impression that circle skirts are not for me. This particular skirt is sewn together in six wedges, with options for a woven elasticated waistband or a knit yoga band. It also has options for a shorter upper layer with or without a vertical casing to gather it upwards, and for inseam pockets. It comes in sizes 2-20, and there is a child's version as well as a free baby version that you can get by subscribing to Pienkel's newsletter. For more information, more tester photos and a limited-time coupon code for 50% off, go here. 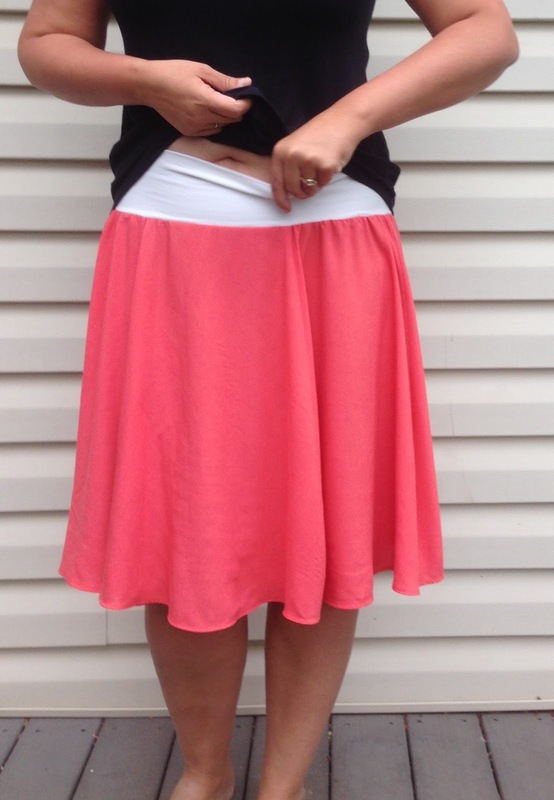 Although my measurements put me in a size 18, I knew I'd want less ease, so I sewed the size 16. To further reduce the stick-out effect that I dislike on cotton circle skirts, I tossed through my sewing room looking for the drapiest fabric in my stash. I juuuuust managed to squeeze the pattern pieces out of a small piece (44" long) of 54"-wide coral-colored rayon challi. I made the yoga waistband view using a cotton/lycra with outstanding recovery. The knit was stretchy enough to stand on its own without elastic, so I left the elastic out. I like how the wide waistband allows me to sit the skirt portion lower on my hips. Plus it's really comfortable. I am kind of curious how it would look if I had matched the knit to the skirt fabric, but I was working from stash and didn't have any coral knit. The pattern itself is easy to sew and can be made in one sitting. There are only two pattern pieces for the view I made (and only five for the most elaborate view). Pienkel's instructions are clear and thorough, and she includes helpful tips like staystitching the panels before sewing to keep them from stretching out. She also includes an option for finishing the hem with bias tape. I opted to do a turned-up hem. I also let the skirt hang for a day before evening out the bottom and hemming it. I am really happy with the finished product. Circle skirts are never going to be an everyday sort of garment for me, and I would not make one in anything with less drape than this challis. But the drape lessens the visual bulk that circle skirts can add to the abdomen and hips, and the wide knit waistband makes it very wearable for me. One of the testers left out one of the wedges, which reduced the skirt width further - an idea I might try if I make another Dyyni skirt. The fabric feels lovely on - immediately after I finished it, I ordered some more challis as I didn't have much in my stash - and I know I will definitely be in the mood to wear this skirt from time to time even though it isn't my usual silhouette. I also am currently smitten with the idea of making a midi-length challis version in a striking color - like emerald green or a vibrant purple challis - to wear for special date nights with a pair of ankle-strap heels. Also, I don't currently own any ankle-strap heels so I'd need to take care of that too. What do you think? I made a muslin. A real, honest-to-goodness, quick-and-dirty muslin made out of actual muslin. This is a step that I often skip. This time, however, a muslin was necessary because I was between sizes and also because the instructions are in Polish. I don't speak Polish, and Google Translate apparently doesn't either because among the instructions it gave me were "Step 1: Strengthen contribution clothing (fleece stick)" and "Step 8: Wszyj castle." I understood that Step 1 is probably about interfacing, but Step 8? No idea. This particular pattern comes in Euro sizes 32-52 (waist sizes 24"-42.5" and hips 33"-49.5"). It included 1 cm seam allowances and pretty thorough pattern markings, and the drafting is excellent. I made the muslin in a size 44, which is actually a size down from my measurements, because I was planning to use a stretch woven for my final version. The 44 was a smidge too tight, but I figured the fit would be just right sewn up in this stretchy anchor-print cotton/poly denim from Joann's. 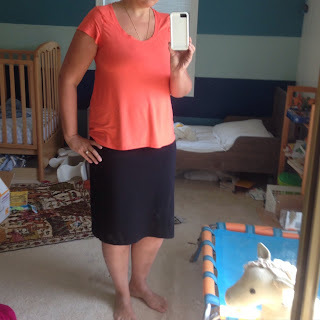 In making the muslin, which only took an evening, I figured out how to construct the skirt (details on that at the end of the post), and I also decided to lengthen both the back darts and the overall skirt by 1". I used a knit interfacing for the waistband facing because I wanted to preserve the waistband stretch. I didn't think about the fact that using a regular straight stitch to sew the waistband to the skirt, and to sew the waistband facing to the waistband (not to mention understitching the seam allowance to the facing) would eliminate all stretch in the waistband. As a result, the skirt sits higher up than I had intended it to, and even though I hemmed with just a 1/2" allowance, I find it just a bit too short on me. I actually like the waist up this high; I wish I had added another 2" inches or so to the length, which also would have allowed me to do a 1" hem. 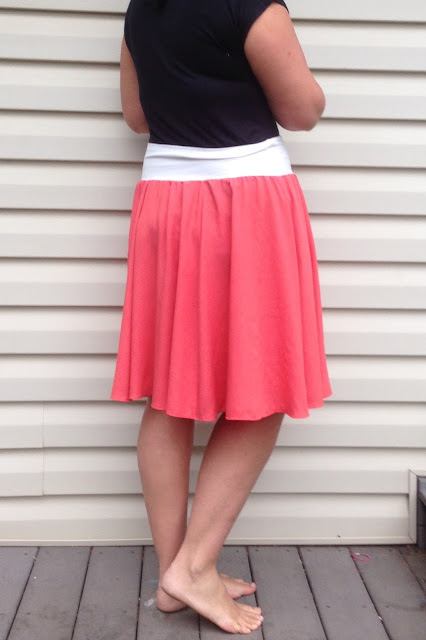 This skirt has a fabulous v-shaped waist and these gorgeous pleated pockets in the side panels. The side panels are cut in one piece, and then you do some origami to form the pleats and the pockets. It is really important to be meticulous in folding the pleats and pockets on the side panels, so as to ensure that the panels are the same length as the skirt front and back pieces. It's really easy to fold a millimeter or two too far, and then all of a sudden you have to shorten the whole skirt (ask me how I know). The pleated pocket detail is what drew me to the pattern, although the pockets themselves are too shallow to be really useful. In the photo above, my hand is slipped into the pocket as far as it will go; you can see the outline of the pocket bottom through the skirt fabric. I suppose that's for the best, though - the skirt is quite fitted and putting anything into the pocket would add visual bulk. 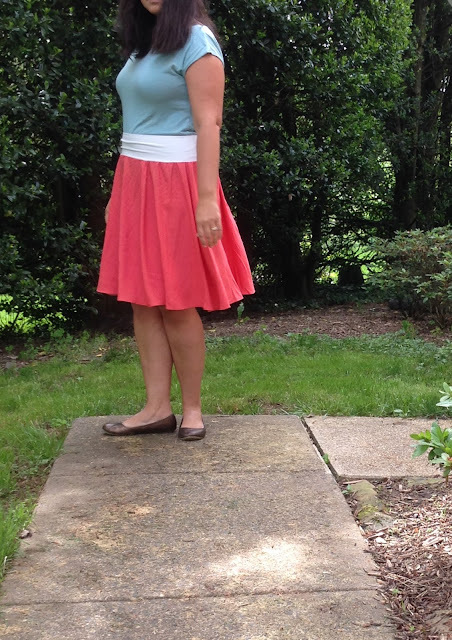 For anyone who wants to try this pattern(and for my own future reference), here is how I sewed the skirt. 2. Sew back waistband pieces to back skirt. 3. Baste to zipper bottom point. 4. Sew seam below zipper and sew kick pleat (I used the instructions that came with my Colette Mabel pattern). 5. Baste zipper. Sew zipper. 6. Interface pocket openings and fold and baste pocket pleats and pockets on side panels. 7. Sew pocket panels to front skirt - finish seams together and press seams towards front skirt. 8. Sew waistband to front piece. 9. Sew front skirt to back skirt. 10. Interface waistband facing pieces and sew them to each other. Finish waistband facing bottom edge. 11. Sew waistband facing to waistband, finish by blind stitching from the inside or by stitching in the ditch from the outside. Done. It's very rare that I buy a pattern the second it comes out - I think it has only happened once or twice, in fact. 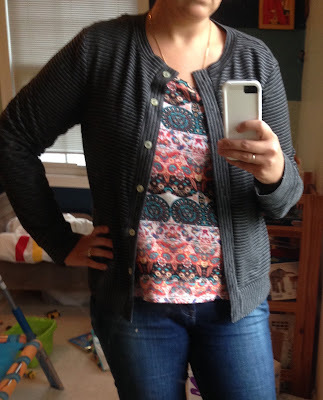 But when I saw the Itch To Stitch Lisbon cardigan drop the other day, I bought it immediately and printed it out that evening. Cardigans have always been staples in my wardrobe, but I only had two that fit - one a heavier wool one with a hole in it, and the other a light pink one that is a bit dressy. The latter is also too light in color to wear daily - at least, that is the case when one has prodigiously stain-producing children who manage to stain your clothes more often than they stain their own. So there was a Lisbon-shaped hole in my closet and it had to be filled. Based on the size chart, I cut a 12 in the shoulders, bust and waist, grading out to a 14 in the hips. I was really tempted to size down, but kept reminding myself that this is a cardigan, meant to be worn over shirts, so I restrained myself. I did a 1/2" forward shoulder adjustment as well. I really always need one. But as you can see, the cardigan dips down in front a bit. I can't work out in my head whether this means I didn't need an adjustment at all, or whether I needed a larger one. Or maybe it's just how I'm standing. Since I took these pictures I've been too busy feeling incredibly comfortable in the cardigan to notice any issues. I found the pattern very well drafted. Everything matches up, and the instructions are clear and thorough. I did find that I had to stretch my neckband absolutely as far as it would go and only then would it juuuuust fit the bodice. My fabric had about 70 percent stretch (the pattern recommends 50 percent), so I might in the future cut a slightly longer neckband to give myself wiggle room. I also had a little bit of trouble fitting the button bands to the front bodice. I believe this had to do with the drapiness and stretchiness of the bodice fabric, and the non-drapiness and non-stretchiness of the interfaced button band. I used knit fusible interfacing, however, the pattern piece instructs you to cut it so that the stretch runs horizontally. If I had cut it so that the stretch ran vertically, I would have had a little more wiggle room. So I ended up having to ease the bodice into the front band, which proved impossible with this stretchy, drapey fabric. I did my best, but still ended up with a few tiny tucks in the bodice where it attaches to the button band. I used a stashed rayon/lycra French terry bought last year from Fabricmart. This stuff is so soft and squishy. It is super-drapey and has a heavy feel to it when the fabric is just in your hands. But it doesn't feel heavy when it's on, at all. It feels light but cozy. And I think I have enough left for a pair of the coziest little girl leggings ever. We have had uncharacteristically dreary weather for nearly two weeks now and this cardigan has been worn almost every day since its creation, including in the evening over pjs! It is that comfortable. I do want to make another one (or two) but my sew-jo is on fire right now, and I have tons of other plans in the works! Love it when that happens.